Of course, if interviewers know those nuts-and-bolts level tactics, job seekers attending the interview probably know those basics too. This goes double for recent college graduates who come freshly prepared from career services centers at their schools. 1. Promising job seekers speak positively. Listen to how the job seeker speaks and whether it is mostly positive. Don’t just pay attention to his or her thoughts on past internships or summer job experiences (because most interview training will teach candidates to speak positively about this). Also key in to how job seekers speak about themselves. The first full-time job out of school can be a scary prospect for some, and that’s okay. Intimidated or not, the best prospective employees meet challenges head on because they have a positive sense of self worth, which their speech reflects. 2. Great entry-level employees are team players. For the most part, entry-level jobs are not lone-wolf operations. Whether in training with a superior or working to support senior staff, it is rare that the first-year employee will do much totally on his or her own. That being the case, the graduates interviewing for your junior marketing associate or sales team support roles should be able to enthusiastically discuss past experience of working with a team. Even if the only example they have revolves around a school project, how they feel about operating in a group setting should be readily apparent, for good or bad. 3. Research is the mark of a hard worker. “Have questions for your interviewer” is another of those interviewing basics that “everyone” knows. You can write off as incurious the job seeker who arrives to your interview with no questions whatsoever about your company or the position (other than “what are the hours?” or “what does it pay?”). So how do you discern the questions that mean this job seeker really put effort into pre-interview research? Do some of your own research. Before beginning interviews, take an hour or two and poke around Google. See what immediately pops up about your company or industry, then see what’s a little deeper into the links. If a job seeker comes in with a question that can be answered by reading the three-sentence summary section on the Wikipedia article about your industry, you know he or she probably didn’t get very far in his or her research before getting distracted. 4. It’s easy to fake enthusiasm, but it’s hard to fake genuine interest. The appearance of enthusiasm isn’t tricky to manufacture. A firm handshake with a smile or a voluble “Yes, absolutely!” to a second interview invitation take no effort and any job seeker with any interviewing know-how can pull it off for 30 minutes or so. More difficult to maintain is deeper intellectual or personal interest in either what your company does or what this entry-level position will allow the job seeker to do or to learn. For this reason, it is crucial to have at least two interviews, preferably with email communication and some sort of brief assignment in between, to gauge the dedication of the entry-level job seeker. If someone interviewing for an executive assistant position at your ad agency seems to know all about your blue chip clients, but just can’t keep up the same level of enthusiasm about the responsibilities of those people he’ll be asked to support, you have a pretty clear indication of where his interests lie, and they aren’t in the position he’s actually interviewing for. Some how-to’s for interviewers seem to reside already in the collective subconscious. You would be hard pressed to find a recently coached entry-level interviewer who does not know that showing up in dirty clothing is a bad move. Paying attention to those basics will certainly weed out job seekers who barely put any effort into their interviewing prep. 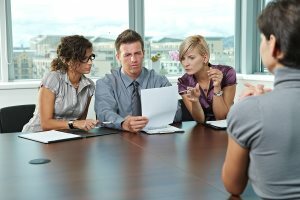 Further evaluations, such as those above, will help separate the practiced interviewers who might be okay employees from the practiced interviewers who will truly add value to your team. Alison Ringo is the Managing Director of KAS Placement, an executive search firm specializing in sales and marketing recruiting throughout the United States.